Susan, our 1940 16’, Cypress Lyman Yacht Tender’s bottom has reached a critical milestone. Reconstruction followed deconstruction that included releasing the keel, garboards and keelson was followed by fabricating and installing a new keelson. As of this morning everything is back in place. The keelson and keel were installed bedded in 3M5200. The garboards were secured to the keelson using #6 x 1” Frearson head silicon bronze wood screws. 3M5200 was applied to the seams formed where the garboards and first strakes meet. Then RJ and I, happily with RJ running the clenching iron inside the hull, clenched the seams from transom to bow. The bottom was faired using four applications of 3M Marine Premium Filler and sanded between coats. John hand sanded all of the strakes, garboards, keel, gripe and stem by hand until the bottom was absolutely fair. We then applied the fourth coat of Clear Penetrating Epoxy Sealer from the waterline down. Why so much? 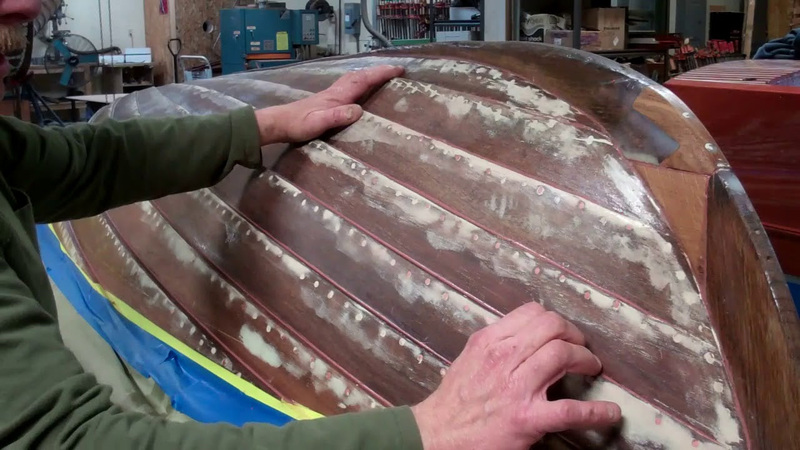 Three coats were applied ahead of the Marine Premium Filler, but with everything sanded between coats, applying the fourth coat post-fairing buys additional insurance against water absorption and accumulation attacking paint adhesion and thereby facilitating rot. From the Smith’s Web site: (CPES) creates a tough, flexible resin system that moves with the wood. It allows the wood to “breathe” so excess moisture does not accumulate behind it, promoting paint-failure and ultimately rot. We then caulked all of the seams, those where two strakes meet, along the garboard-keel seam and that between the strake tails and the transom.